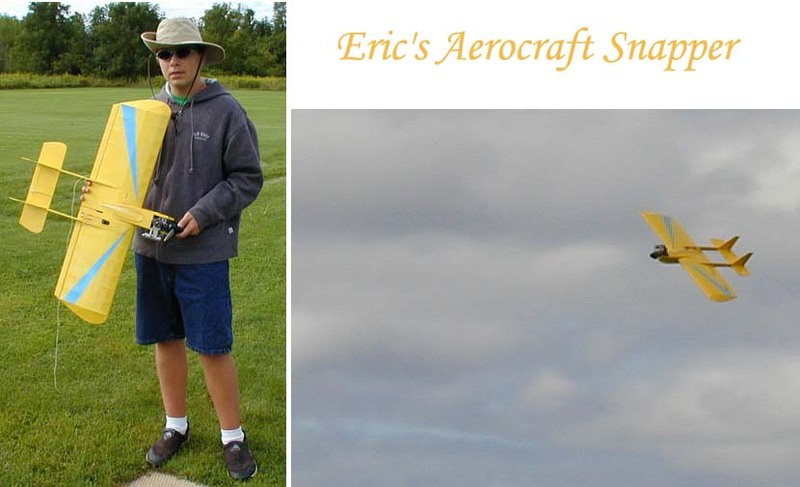 This is another plane that Eric bought at an auction. It is 3-channel; aileron, elevator, and throttle. The book says to power it with an .049 to .09. He debated making it electric. But he decided it would need more power...so he put a Fox .15 on it. Wow, does it scoot! We haven't actually measured the speed, but it's like a fast Wonder. There is a little problem though. For some reason when it comes out of a full power dive it tends to drop a wing. Something is probably vibrating, but we haven't figured it out yet. Also, it needs to be hand launched. Finding a good grip is difficult, but so far, so good. A firm grip right in front of the wing seems to work, although it's slimy and a little too close to the prop for comfort.